Greenlight is a non-profit/non-commercial project with a goal of changing the patent landscape and making it more maker-friendly. Natalia – a phd candidate at the LMU Munich who conducted a legal research on patent limitations and their possible application in the context of making. 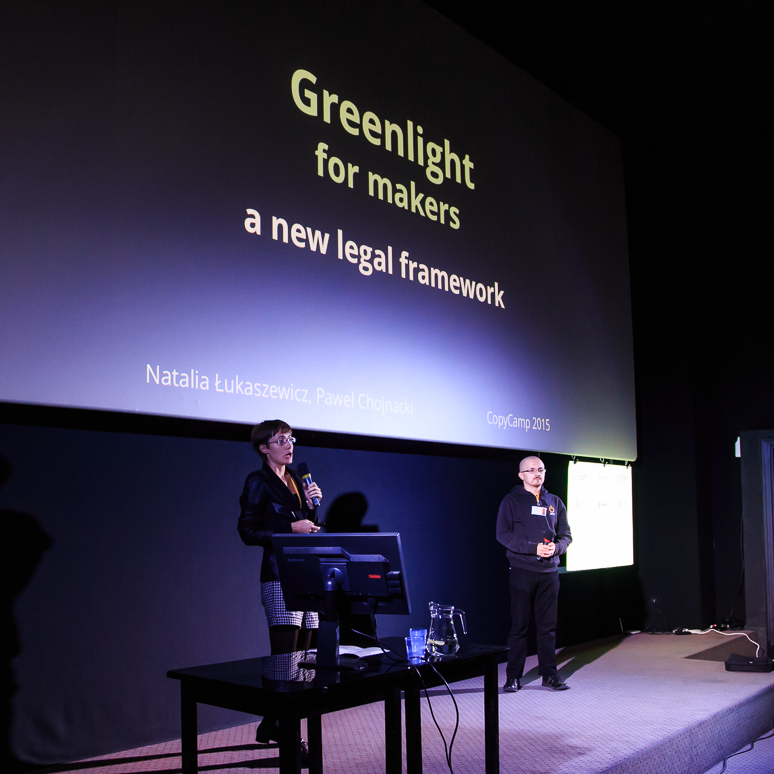 The concluding thoughts present a novel idea of a patent exception for makers, called Greenlight. She also works in the Fraunhofer-Gesellschaft in IP-Commercialization Department. Pawel / alxd - an open source and open science activist who works as a web developer. He is neuroscience and transhumanism enthusiast, and is passionate about cybersecurity education and information politics in Europe. He cooperates with many hackerspaces and makerspaces around the world, including the MENA countries. We both share enthusiasm, passion and a deep conviction that sharing knowledge is one of the most important values of the modern society. We are convinced that local initiatives like makerspaces, fablabs and community workshops are a great development opportunity for local communities and may help fight poverty and activate people in the area. Certainly, if people get excited and passionate about making or hacking, they could find themselves in a much better position to look for a stable and well-paid job. We both also disagree with corporate-driven policy that usurps the rights to knowledge & science and abuses the public system for private interests. In the course of a phd research, it was found that patent exceptions = legal instruments that limits the effects of a patent for certain uses, for example, private and non-commercial use or experimental use; cannot cope, support and secure the broad scope of making activities. That leads us to the point where tinkering and making, and then sharing ideas and knowledge with others, or instructing them on how to achieve a given solution become almost illegal – patently suspicious. The greenlight delivers a remedy. The framework comprises of two elements: a legal proposal of a patent exception called Greenlight and a database, called Greenbase. Greenlight opens patent exclusivity on tinkering, tweaking, mixing, and sharing the results of own work with others – public and non-commercial activities. Effectively, it targets those patented solutions that are within reach of hobbyists, technology freaks, and makers who do not work in highly equipped labs - but have their creative minds, skilful hands and other makers to work with. Here, we touch a sensitive patent issue: decreasing patent quality. Beyond any doubt, greenlight would “unlock” patent exclusivity of trivial patents. To facilitate the combat with this non-trivial problem, we want to establish Greenbase. Greenbase serves a collector of makers ideas subjected to the greenlight-protection. Moreover, it will be a well-structured source of makers-driven prior art to be used by patent offices during patent examination. Every maker-generated solution submitted to the database would be automatically protected by the greenlight exception. Every maker around the world would be able to use it non-commercially and share the modifications, while patent offices would know that it is disclosed (non-novel) and obvious (non-inventive), and that it should not be covered by any patent. a contact with patent offices. First, we need to create a strong pushing movement, otherwise patent authorities may stay indifferent. We will launch a discussion in academia and patent community about the significance of the maker movement, and about the necessity to rethink the current rigid mindset and fears against opening patent system for new technological and social phenomena. There will be more information on the project soon!